If you have been following our blog for awhile, you already know how much I LOVE iS Clinical. My husband and I both use several of their products weekly and are obsessed with iS Clinical Active Serum. It's an amazing three-in-one product that treats acne, aging, and redness. I could go on more....but since I have blogged about it so many times previously, I will stop myself. Another fave is the iS Cosmeceuticals Extreme Protect. This is an amazing sunscreen and perfect for everyone especially those who may be more prone to skin cancer. This sunscreen actually protects and repairs collagen and cell DNA making it truly unique. Our company representative shared a personal story of her mother who suffers with skin cancer. She typically has to go in annually and have several areas removed. After using this sunscreen, she hasn't had to go back in for ANY removals....and it's been well over a year. If that doesn't speak for this product, I don't know what will! iS Clinical Hydra Cool Serum is another favorite in our household. It was the very first moisturizing serum I had ever used...and I'll admit, I was skeptical and pleasantly surprised. Hydra Cool is fast absorbing and still incredibly effective. I actually now prefer the moisturizing serums over creams...which I never thought I would say. You have all heard me rave about iS Clinical Youth Complex and iS Clinical Youth Eye Complex, but for those who may be reading for the first time...these are two of my all time favorite products. I use the Youth Eye Complex daily with my Clarisonic Opal and LOVE the results. Check out some before and after pictures here. The Youth Complex is also equally as awesome with 97% of people seeing results within the first hour of application. That's right....THE FIRST HOUR! Bottom line? iS Clinical is simply one of the best lines I have ever used. They offer a broad range of products to treat practically every skin concern. 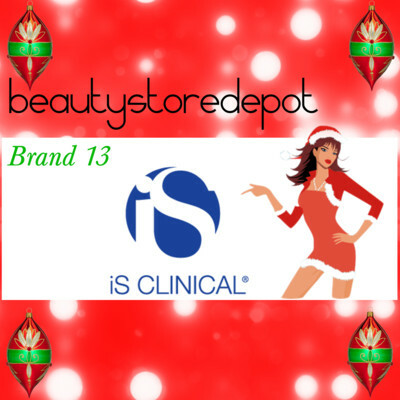 This week iS Clinical is one of our featured brands for our 12 Brands of Christmas promo. We will be giving away an iS Clinical Anti-Aging Kit which includes: Cleansing Complex, Youth Complex, Active Serum, and Sunscreen SPF 25. This kit is valued at $315! Wanna win? Just follow us on Facebook for more details, giveaways, and so much more! I have received samples of the iS Clinical products and absolutely love the results and that's just with sample sizes...I can only imagine the results with continued use.